Where does it all begin? How do you grow up to become a thru-hiker? We get to hear from Rock Ocean as he interviews Kimchi and Par 3, from Gizmo, and even from Gizmo’s mom as we explore our origins as thru-hikers. Also, we have a big announcement – Sounds of the Trail is looking for 2016 trail correspondents. Interested? Check out our page and JOIN US. Music courtesy of Baby Gramps. Sounds of the Trail is transitioning to an off-season format. In this week’s podcast we shift our focus to the third trail in the Triple Crown, the Continental Divide Trail, and get inspired by some youtube videos. Special Guests Liz and Bryan (along with Bumblebee Tuna and Toni the Tiger). During the hiking off-season Sounds of the Trail is switching to an every-other-week release schedule. Sounds of the Trail is planning on sticking around for a second season of thru-hiking podcasting in 2016, so stay tuned for more info on that. We finally get to do a recap with both Kimchi and Par 3 on finishing the trail. We discuss the end of the time on the trail, their best moments, and what it means to be a thru-hiker. It’s the end of A season, but it’s not quite the end of THE season, at least not for a few hardy hikers or for Sounds of the Trail. Not many northbounders are still braving the mountain passes, but we ran into a few still heading for Maine. Special guests Smokey Bear, Homegrown, and Bailey the dog. Sounds of the Trail is back after a short hiatus. We’re in the process of transitioning to an off-trail broadcast, and figuring out what that’s going to look like. We have some good stuff lined up so be sure to tune in. If you are interested in getting in contact with Smokey Bear and Homegrown, either to do a little Trail Angel-ing or to possibly collaborate on some of the photo/video that they’ve been collecting, shoot an email to soundsofthetrail@gmail.com and I will get everyone in touch. We’re happy to be back! Thanks for listening. Thru-hikes are a hugely physical undertaking that take a lot of time and a lot of money – or at least the ability to forego earning money. A lot of people ask – how do you make a thru-hike happen? We have no magical secrets to share – but we do have some thru-hikers share stories about their own journeys on the Appalachian Trail. Young, old, and in-between, the trail is for everybody. Special guests Spicy Guy, Bluebird, Hakuna Matata, and Sock Ninja. We delve dangerously close to “overly inspirational” territory in this podcast, but I don’t care. You need to listen to this. Check out Kimchi’s photographic work (and maybe even buy a print) HERE. I am going out of the country for about a month for work. I’m going to try to keep the podcast going while I’m gone, but I can’t make any promises. I’m packing my microphone just in case. This week’s podcast revolves around one Maine thing – the people and places of Maine. We get to hear from thru-hikers, trail angels, and trail Maine-tainers (heh heh) working with the Maine Appalachian Trail Club. Special Guests are Pain Wizard, Scout, and the MATC. What have YOU done to support your trails today? Check out the Maine Appalachian Trail Club if you want to support them. Do you want to support all your trails, and not just Maine? Then please consider telling your congressman! Go to Who Is My Representative, find out who is representing you, and then TELL THEM that we need trails! If you live outside the USA, you probably have trails too! Go help out. In our continuing attempts to be neither educational nor informative, we have an entire podcast episode about thru-hiking gear that fails to provide any real useful information. What kind of gear do you need to thru-hike? Depends on who you ask. Special guest Chia Pet and many others. Sounds of the Trail finally covers our most requested topic: thru-hiking with dogs. We hear from three different dog owners on the challenges and rewards of thru-hiking with a dog. We also get to hear from our fellow thru-hiking podcaster, Ratatouille, who produces Trailside Radio. Special Guests: Oyster, Joan of Arc, and Sleddog. If you haven’t checked out Trailside Radio, you should! Check it out here. Music by: Baby Gramps. Thanks Baby Gramps! Thru-hiking is a “bucket list” item for a lot of people. In this podcast, we talk about pursuing our other dreams, making a thru-hike happen, and start thinking ahead towards the end of the trail. (Don’t worry, we’re not there yet.) Our special guests for this episode are two hikers we’ve heard from before: Patches and Kodak, both bringing us some new trail wisdom. Par 3 is at PCT Days up in Oregon as he gets ready to hike Washington and finish up his thru-hike – we’ll hear from him next week. He’s been interviewing like crazy. If you missed it last week, don’t forget this week – check out Patches’ Blog. Also, come on over and take a look at Kodak’s Photography. Thanks for all the listener love! We love you all. Let’s follow along with Kimchi as she gets back on trail at Mt. Katahdin to begin her flip-flop are the Appalachian Trail. Special guests for this podcast are Patches, Mighty Mouse, and Sparky. Check out Mighty Mouse’s Blog and Patches’ Blog! 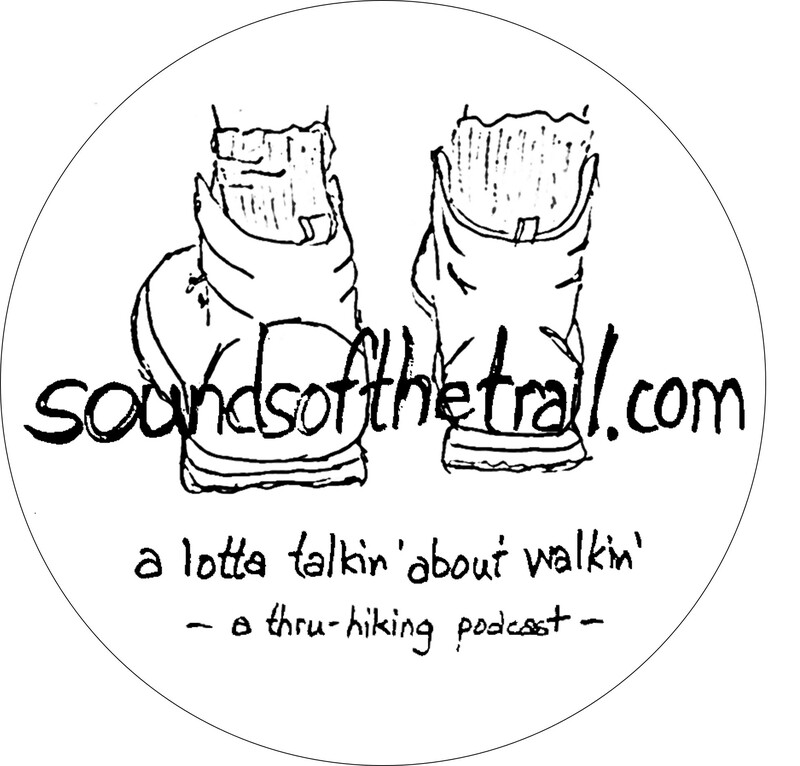 Or, get a SOTT sticker by sending me an email at soundsofthetrail@gmail.com. If you aren’t into free stuff or blogs, head over to our Instagram and see photos of our contributors!